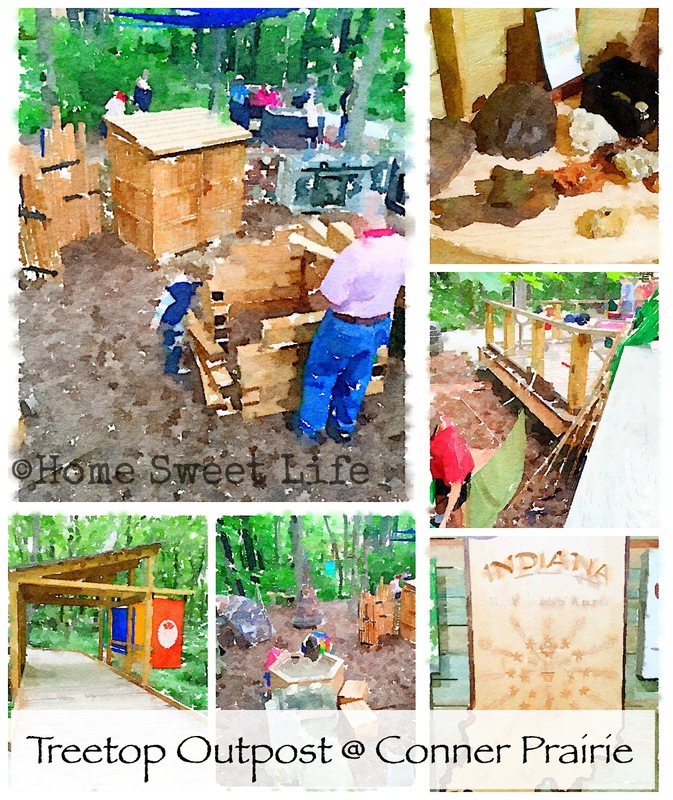 Home Sweet Life: Treetop Outpost at Conner Prairie ~ Road Trip Time! Treetop Outpost at Conner Prairie ~ Road Trip Time! Just north of Indianapolis lies one of Indiana's treasures: Conner Prairie! It is a living history museum where guests learn through interaction with costumed interpreters while being immersed in Indiana's past. 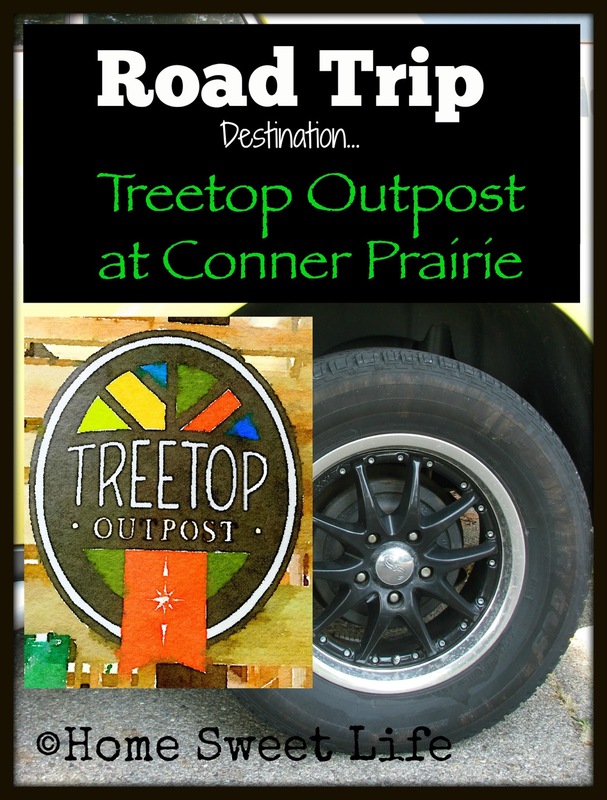 While Conner Prairie has long been known for its quality presentation of multiple times in Indiana's history, it is fast becoming known nationwide for its newest area: Treetop Outpost! This newest hands-on exhibit is centered around the four-story tall wood and steel Treetop Outpost and includes dozens of activities for all ages. We have been members of Conner Prairie for more than a decade, and I must say, they have outdone themselves with this newest addition! There are learning and play centers outside the structure, as well as various interactive activities inside. Words cannot describe everything there is to do at Treetop Outpost, but I'll try to at least whet your appetite to visit soon! As you enter the Treetop Outpost, you cross a slightly elevated boardwalk through a portal that frames your first view of the area. The first outdoor area you see contains three archaeological-dig-type boxes with "relics" for children to find from 200 AD, the 1820's, and a 1950's kitchen. Just beyond this is an area for exploration in art through water painting, twill weaving, or nature framing. Rounding the salvage wall, you will find multiple opportunities to build using various materials. Many of these are appropriate for all ages, but your littlest ones (6 and under) may require some help. This area also hold a unique sand and granite art exploration station. Approaching the actual Treetop Structure, you will find the outdoor music area where kids and adults alike can listen to recordings and create their own music on three different outdoor instruments. On one of the days this past weekend (Treetop Outpost officially opened on July 1, 2016,) I passed a group of young adults doing a drum and bugle corp style rendition on the drum set. It was quite impressive. Almost as impressive as when a kid played Mary Had a Little Lamb on the xylophone . . . but I think the kid won with the cuteness factor. For entering the four story Outpost, you can choose the suspension bridge that begins a few steps up from the music platform, or you can take the ADA accessible ramp past the binoculars and flag station. The main floor is chock full of hands-on experiences. 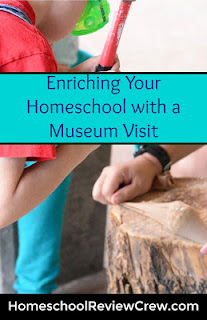 Learn to tie knots, explore Indiana on the map wall, get up close and personal with the bugs, moss, and fossils via your fingers and a magnifying glass, these are just some of the options on the main floor. I was impressed with the variety of Hoosiers featured on the learning wall where boxes represent their major reasons for notoriety and tags give you details. This is outdoor learning at its best! Just to the side of all of these activities is a small play area with wooden figures and animals for the make-believe age little ones. The back side of the Outpost has stunning views of the woods and wildlife. When you venture up the stairs to the second floor, you'll be met with a stunning view of all the areas in front of the Outpost, as well as the other end of the flag station. This floor is an excellent place to stop and look out into nature at a height level many people don't readily have access to. Currently, there is a mama robin raising her fledglings in a nearby tree. The third and top floor houses a telescope that can be used to view far and wide. I think the views will be spectacular this Autumn when the leaves change color and begin to fall. For those who venture down the steps to the basement of Treetop, they will find a quaint little library with books for all ages about the outdoors: picture books, field guides, and more. The seating for the library is reclaimed chairs from the Indianapolis Indians's old home: Bush Stadium. If you've visited Conner Prairie in the past two years, you may be wondering how this newest area interacts with the Nature Walk. Treetop Outpost is situated at the top of the Nature Walk, which has also seen some new additions this Summer. You can access the Nature Walk either via a path past the base of the Outpost, or by walking out of the basement and taking the spur around to the Nature Walk. 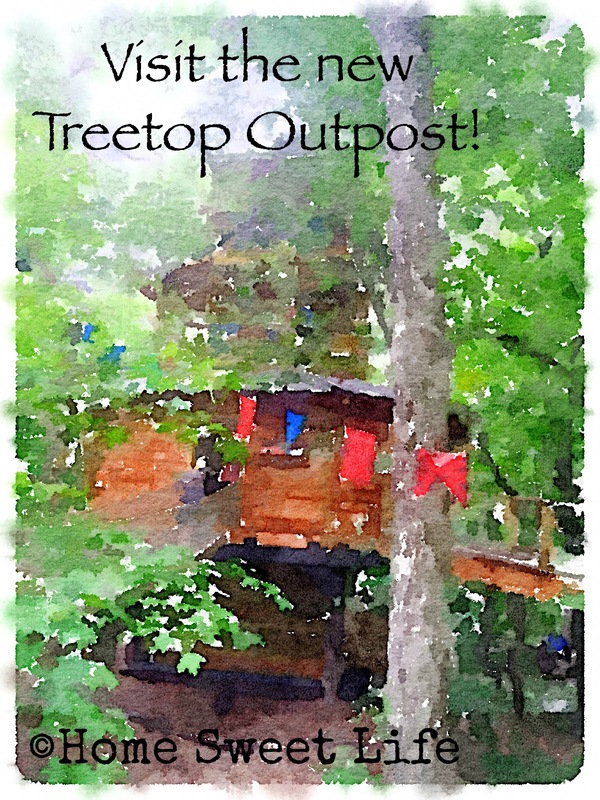 Be sure to allow yourself at least two hours for your first visit to Treetop Outpost. Because there is so much to see and do in all of the historic areas at Conner Prairie, not to mention in the museum center itself, we are recommending an all day visit. Conner Prairie is open Tuesday-Sunday during the Summer and Fall from 10 am-5 pm. There are reasonably priced food offerings at the Cafe on the Commons, or you can pack a picnic lunch and enjoy it at the tables in front of the museum center. Your admission price gives you all day access to the park, so you can return to your vehicle at your leisure throughout the day for lunch, sunblock, or bug spray as needed. Consider purchasing a membership while at Conner Prairie. A basic family membership is only $115 for the whole year (12 months from date of purchase purchase.) For a family of four, you'll begin seeing the savings on only your second visit. If you choose to purchase one-day admission and then wish you'd gotten membership instead, stop at the ticket counter before you leave. Depending the level of membership you choose, you can apply most, if not all, of your one-day admission to a year-long adventure! Treetop Outpost is a wonderful addition to an already stellar family-friendly, hand-on history park! Plan your road trip soon, and bring your friends! For more information on Conner Prairie, visit their website. Note: all pictures used in this review were taken on my iPhone, and rendered through our newest favorite app: Waterlogue. FTC disclosure: We did not receive any compensation for reviewing Treetop Outpost. All opinions are our own. We are simply so impressed with it that we had to share it with you!